Insert the SD card into the slot. The PLAY light should blink by itself for a few minutes. If more than just the PLAY light is blinking, that's an error code, see HELP below. Once the blinking stops, push in on the SD card to eject it. 1. Any standard SD card, almost all digital cameras use these cards. Any existing files on the card will not be harmed. 2. A computer that can read SD cards. Many desktops, and almost all modern laptops have a slot for them. 3. An internet connection to download the files. You only need this if you don't have the original SD card. Download the file from the link below, save it to your Desktop if it asks. Double-click on the downloaded zip file, then on the Spirit_2012_Final folder. You should now see two folders. 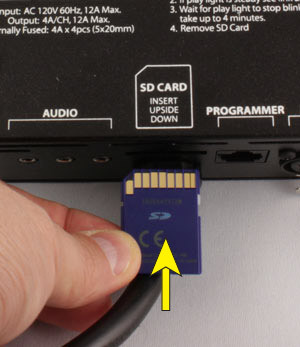 Insert the new SD card into your computer, then open the drive so you can see any files on the card. The card we're using is empty. Copy the FI-214 and FI-SHOWS folders to the card. Once the copy is complete, eject the card and remove it from the computer. Insert the SD card into your lighting controller to update it. Scroll up to the top of this page for detailed instructions.